The majority of women's clothing lines, including bridal collections, are based on a size 8 sample that is graded to create a full range of sizes. 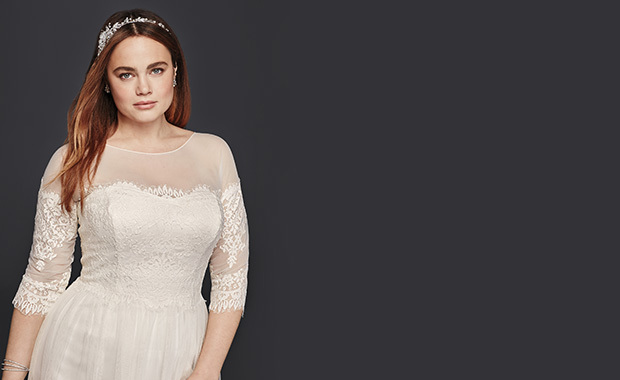 The David's Bridal Plus Size collection is designed differently: our plus size fit model is a size 18 and each pattern is based on research gathered from real customers' measurements. This unique focus on fit and sizing is the reason our plus size wedding gowns fit and flatter you like no other. Check out our Figure Flattery Guide for detailed styling tips and suggestions for your specific body type. Over 60 years of experience has taught us that strong attention to detail and high quality craftsmanship are essential to creating beautiful bridal gowns. Inside and out, a variety of design elements work together to create each gown in our collection. It's easy to appreciate the beauty of fine fabrics and hand-beaded embellishments, but just as important is what's underneath: high quality lining and flexible boning for added shape and support. The result? A smooth, flattering silhouette with exquisite details so you look and feel fantastic on your special day. Whether your wedding style is classic, casual or glamorous, we have the perfect wedding dress to fit every bride. In addition to plus size bridal gowns, we offer the latest looks in special occasion and bridesmaid dresses up to size 30. We also offer plus size lingerie and wide shoes. Another David's Bridal difference is that each location offers a wide range of wedding gowns to try on in sizes 14W to 26W, with select styles in 28W and 30W, so you can see how you'll look on your special day. At your appointment, an expert stylist will help guide you through every step of the wedding dress shopping experience. From style advice to undergarments to accessories, David's Bridal will outfit your every need. Our brides often tell us that they are amazed (and elated!) to find the dress of their dreams at such a great value. We care about each and every bride and want to make sure you look and feel your absolute best.